Regardless of the dormitory room configuration, the track can be arranged to offer some form of privacy when both student are in the room. Layouts can range from a straight divider that splits a room to a track system that follows the contour of a bed or other furniture. This can be extremely helpful for a number of scenarios including offering blackout capability that shields one roommate who tries to sleep from another who may have lights on studying or watching TV. This also affords students privacy while changing when guests are present. Finally, the curtains can provide a way to shield themselves from visual distractions when studying despite other activities within the dorm room. If the dorm rules preclude a track from being mounted to the ceiling, another option is to use curtain tracks and curtains on the bunk beds that are provided in many dorm rooms. By adding a simple track to the bunk frame, the lower bunk can be transformed into a sanctuary of sorts that provides a cocoon that shields its inhabitant from all that is going on in the room, while reading or rest is a priority. In addition to blocking light, the bunk curtains can also dampen sound as well. 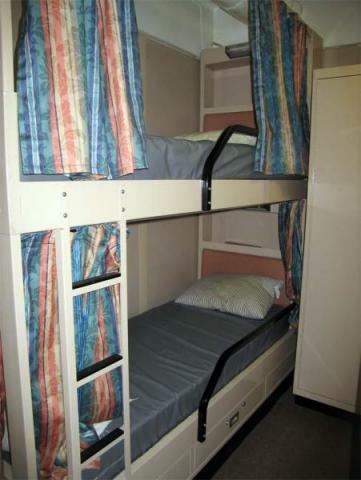 The same concept that has been used for years on bunks in ships can be applied to dorm room bunk beds as well. In addition, let’s not overlook the fact that divider curtains, bunk curtains, and window curtains can really transform the look of a dorm room. University dorm rooms are bare bones when students arrive, offering a blank canvas upon which each freshman can express themselves during their initial foray into independent living. The curtains can be a great way to create, adding flair to the appearance of the room while enhancing the functionality too. 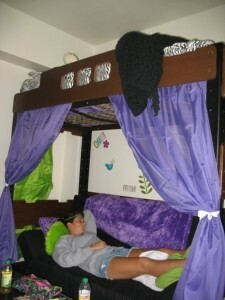 Whether the student has the budget to order custom divider curtains, or chooses to transform their room by using a bed sheet or drop cloth to make their curtain, the combination of a curtain and track system can make a big difference in how a dormitory room looks as well as how well it meets the student’s needs. Any students who need some advice are welcome to speak with any of our "Professors" who are experts with curtain track systems and can surely find a solution to meet any dorm room need.